A winter storm brought snow and blizzard conditions to parts of Minnesota over March 3-4. Many observers in central and northeastern counties reported 3 to 7 inches of snowfall, with windchill values ranging from -25F to -41F. Winds gusted to over 40 mph in places like Morris, Granite Falls, Olivia, New Ulm, and Redwood Falls. Following this storm a cold air mass gripped the state. Duluth set a record cold maximum temperature on March 4th with a high of 3°F, while International Falls and St Cloud also set record cold high temperatures with readings of only 2°F and 6°F, respectively. Then on March 5th some northern Minnesota communities reported new record lows, including -37F at Brimson, -40F at Cotton, -31F at Floodwood and Cook, -30F at Hibbing, -29F at Crane Lake, and -28F at Brainerd. The -40F reading at Cotton (St Louis County) was the coldest temperature in the nature on March 5th. Temperatures rebounded abruptly on Friday, March 6th soaring into the 30s and 40s F. This warmer than normal pattern is expected to persist well into the third week of March. Mean monthly temperatures for February were cold for all locations in Minnesota, ranging from 8 to 13F below normal. Extremes for the month were 49F at Pipestone on the 7th to a low of -43F at Cotton on the 20th. Minnesota reported the coldest temperature in the nation 8 times during the month of February and overall based on the statewide average temperature February of 2015 was the 14th coldest since 1895, but not as cold as February of last year (which was 9th coldest since 1895). The cold temperatures of February pushed soil frost depths down to 30 to 45 inches. February was drier than normal for most observers in the state, with total precipitation values commonly less than half an inch. Some areas of the state reported over a foot of snowfall including 13.9 inches at Grand Meadow, 14.0 inches at Faribault, 15.9 inches at International Falls, and 16 inches at Isabella. This week the Climate Prediction Center and the International Research Institute for Climate and Society finally declared that an El Nino episode is underway. For the first time this year measurements of climate anomalies in the equatorial Pacific Ocean equate to a weak El Nino episode. The CPC forecasts suggests a 50-60 percent probability that this episode will last throughout the northern hemisphere spring. The United Kingdom Meteorological Office announced this week that based on preliminary data the United Kingdom has recorded its sunniest winter on record dating back to 1929 when daily sunshine record keeping began. The winter of 2014-2015 (Dec-Feb) beat the previous record for average total sunshine hours from the winter of 2000-2001. Pete Boulay of the Minnesota State Climatology Office has recently updated the Twin Cities Winter Misery Index. The rating of the current winter season (2014-2015) is 52 points, no where near the 207 points accumulated last winter. You can read more about this winter and its rating on the WMI scale at the DNR-State Climatology Office. 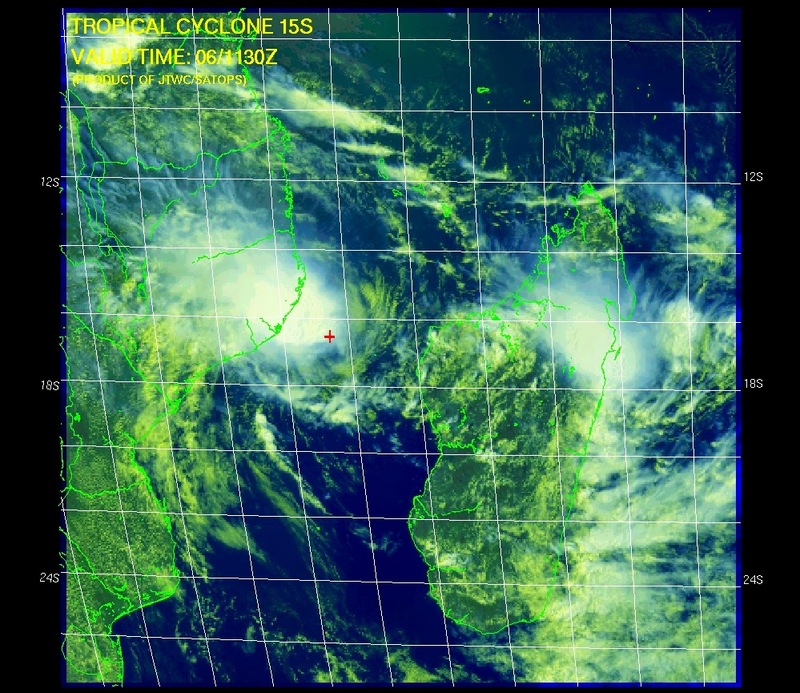 A tropical cyclone was bringing heavy rains and strong winds to portions of Mozambique and Madagascar this week. It was expected to persist into the weekend and even gain in strength. Some northern Arizona residents were smiling this week as a winter storm system brought several inches of snowfall and 1-2 inches of total precipitation, the most for the year so far. This brought some relief to areas of that state which had been in extreme drought for a long period of time. I see the forecast calls for consecutive days in the 50s F next week. That's wonderful! When was the last spell of 50F weather in the Twin Cities? Actually, not that long ago, over December 13-15, 2014 daytime temperatures reached the 50s F in the Twin Cities area. The outlook calls for above normal temperatures through the third week of this month, so we may even see 60F in some parts of the state in the coming two weeks. The average MSP high temperature for this date is 32 degrees F (plus or minus 11 degrees F standard deviation), while the average low is 16 degrees F (plus or minus 12 degrees F standard deviation). MSP weather records for this date include: highest daily maximum temperature of 69 degrees F in 2000; lowest daily maximum temperature of 6 degrees F in 1899, 1920, and 1932; lowest daily minimum temperature is -16 degrees F in 1890; highest daily minimum temperature of 44 F in 1983; record precipitation of 0.97 inches 1983; and record snowfall is 7.0 inches in 1900. Average dew point for March 6th is 15 degrees F, with a maximum of 54 degrees F in 1983 and a minimum of -18 degrees F in 1955. The state record high temperature for this date is 76 degrees F at Canby (Yellow Medicine County) in 2000. The state record low temperature for this date is -41 degrees F at Embarrass (St Louis County) in 1996. State record precipitation for this date is 1.71 inches at Fort Ripley (Crow Wing County) in 1859; and the state record snowfall for this date is 16.0 inches at La Crescent (Houston County) in 1959. The first six days of March, 1908 brought nothing but snow and cold. Many areas reported over a foot of snow. Long Prairie and Two Harbors reported 19 inches, while Collegeville received 20 inches. Temperatures warmed into the 40s and 50s F the second week of the month and melted all the snow. March 5-7, 1955 brought a Cold Wave to the state as temperatures fell from the mid 30s F to subzero readings following a snow storm on the 5th. On the morning of March 6th temperatures ranged from -25F to -35F in the north to -10F in the south (Farmington and Waseca). At Thief River Falls the daytime high only reached -7F. A major winter storm brought freezing rain, ice, snow, and a blizzard to the state over March 2-6, 1966. Many observers in northern counties reported over 20 inches of snowfall, while Itasca State Park and Park Rapids received over 30 inches. In the Duluth area trees and power lines were coated to 2-3 inches of ice causing breakage and widespread power outages. Some roads were closed for days with the state patrol making trips on snowmobiles to bring stranded motorists to shelter. March 5-9, 2000 brought a very early start to spring across the state, with widespread sunshine and record-setting high temperatures. Nearly every region of the state saw temperatures climb into the 70s F while some overnight lows remained in the 50s F, more than 30F warmer than normal. The warm spell ended abruptly on March 10th with a snow storm and temperatures dropping off into the teens. A significant warming trend will take place over the weekend, pushing temperatures well into the 30s and 40s F under partly to mostly cloudy skies. There will be a chance for light snow in the north. Continued warming into next week as temperatures rise above normal under mostly sunny skies.